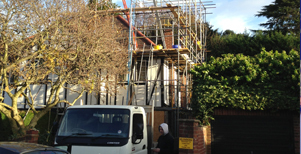 We are an independent company, with over 10 years' experience who can supply, erect, hire and dismantle all types of scaffolding. We are pleased to offer a variety of professional services however large or small of scaffolding supply and hire, domestic scaffolding, commercial scaffolding, industrial scaffolding, temporary roofs and structures, design and labour, scaffolding light and alarming and paving license applications. We are fully insured and available 24 hours, 7 days a week! Free quotations at very competitive prices with the highest standards and customer satisfaction. Take a look at some of our work over the years. We're pleased to announce we're now on Facebook! Our Facebook page has been created to showcase our work, to interact with people, and to further bolster our web presence. Please take a moment to view, like and share!